Provide an inviting environment with the Lasting Impressions line of commercial site amenities. Made from durable steel crafted into a contemporary style benches with classic clean lines and modern design accents. The powder-coating finish with UV additive ensures these benches will make inviting impressions long into the future. 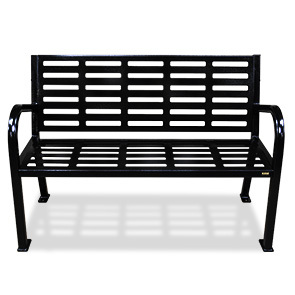 Lasting Impressions Commercial benches are extremely sturdy, the seat and back is constructed with heavy-duty 11 gauge steel tubing and 14 gauge steel used for the cross bracing support bar.